More rhubarb, this week cut straight from the garden. 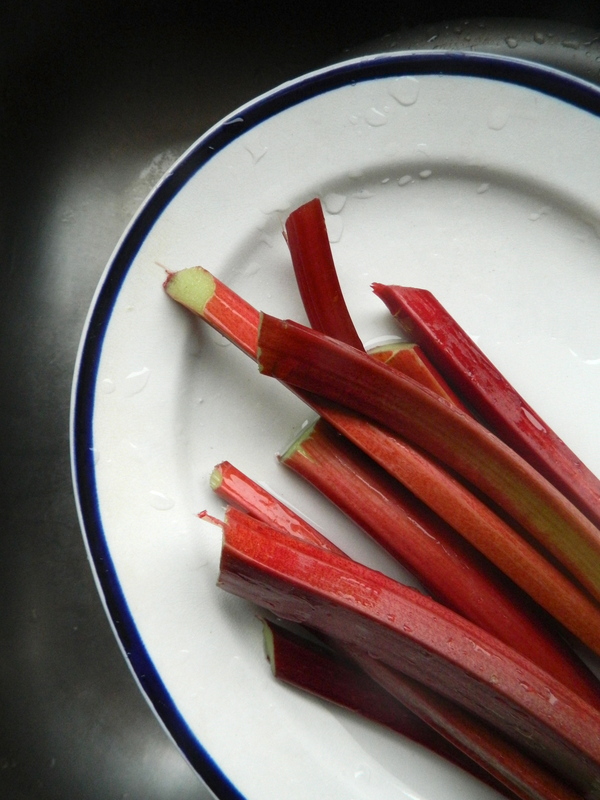 I love rhubarb, perhaps because I have always been – and continue to be – slightly puzzled by it: I can never remember what it tastes like until I eat it, and every time I cook it it tastes different anyway. 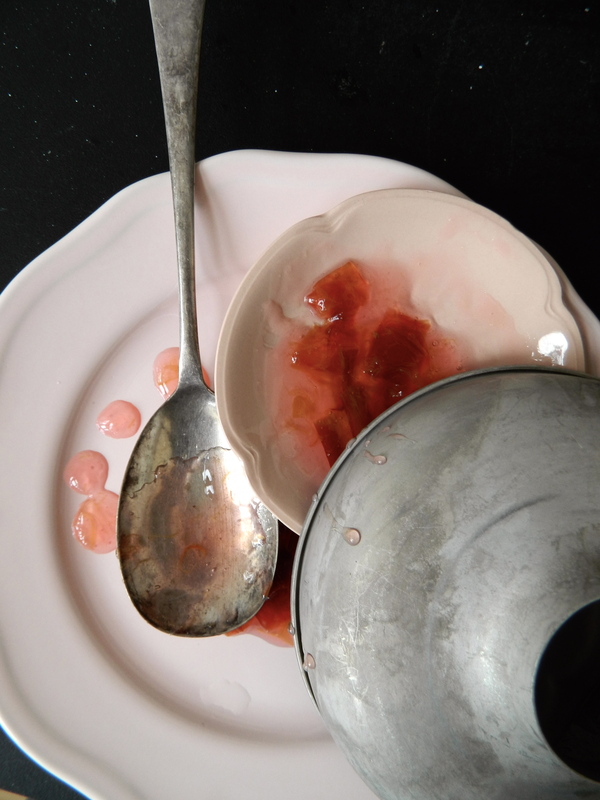 I decided to try a recipe for a rhubarb jam from one of my favourite cookbooks, Diana Henry’s Salt, Sugar, Smoke and it turned out absolutely lovely: the delicate flavours of rhubarb are heightened and enhanced by the more exotic, slightly Eastern flavours of rose-water and cardamon pods. The colour of the jam is the prettiest shade of pink imaginable and the texture is soft and yielding, making it perfect for swirling into desserts, such as Greek yoghurt (‘the meeting of two mouth-puckering foods’, according to Henry) or into comforting rice pudding. You could also fill a celebration cake with it, along with mascarpone or whipped cream and fresh strawberries. It’s a great jam and it’s very easy to make – a real testament to the book, which has been described as a modern-day bible for preserving; making the difficult (and slightly frumpy) world of jam, jelly and pickle-making cool and exciting and beautiful. But Henry’s latest book A Change Of Appetite couldn’t be further from this world of salt, smoke and its multitude of sugars (jam sugar, caster sugar, brown sugar, Demerara sugar, granulated sugar…) – it’s a book about healthy eating, which rather unsurprisingly, doesn’t include a huge amount of sugar. I read several reviews of the book before I managed to get a look at it, all of which mentioned that it was written as a response to the growing number of requests from friends and readers for advice on how to cook quinoa or fresh fish or greens. I will admit that at this point I was worried: while I am all for healthy eating and reducing unconscious, unfettered sugar consumption, I have a serious aversion to the food blogs and books which promote healthy food for the sake of the healthy rather than the food – avocado used as a miracle ingredient in everything from cakes to ice cream; endless chatter about vegetable spiralling machines and all those rather tadpoley chia seed puddings. I don’t understand where these creations fit into real life; they’re dull, joyless and to quote Henry once again, a little bit ‘precious’. Thankfully A Change Of Appetite is not like this. According to the author, eating should be ‘accidentally healthy’ (ie, delicious first); and, secondly, ‘considered’, meaning that the eater should work out for themselves whether the food is really ‘bad’ or ‘good’. Where I really paid attention, though, was when Henry noted: ‘My biggest problem was thinking about food in terms of ‘healthy’ or ‘unhealthy’. I can’t think of meals as sets of nutrients. A meal is a colourful assembly of foods – many of which we don’t quite understand in terms of health – that should be, first and foremost, enjoyable’ – and this is what the book offers: gorgeous, bright, lively-looking recipes, which seem to have been designed with their taste rather than their superfood status in mind. Writing on the topic of sugar in the introduction, Henry noted that there is some included in a number of the recipes: ‘it’s in cakes, sorbets and other puddings that are largely part of healthy menus and are meant to be kept for treats, not eaten every day’. ‘There’s also some sugar in dressings, especially those from South-east Asia that depend on the balance of hot, sour, salty and sweet tastes. I think that’s okay. The problem isn’t with what you eat at one meal, but what you eat across the board’. I was glad to read this, and while I am certain that we should actively try to reduce our passive consumption of sugary foods or, worse still, of those secretly sugary foods, I do not think that we should throw out sugar completely, as many of the more militant food bloggers would have us do. Sugar is too much a part of our collective food memory (vegetable pickling, meat curing, fruit preserving) and our individual food memories (jelly and ice-cream, warm scones, freshly made raspberry jam, a birthday cake, homemade biscuits) to do away with completely, and I would not trust any would-be foodie who advised it. What we need is balance: treats should be treats; weekday foods should be just that, weekday foods. Indeed, while we perhaps need to recast our classification of what is a treat and what is a staple, we shouldn’t banish these sorts of foods entirely. Jam made with rhubarb from your own garden – and yes, sugar, lots of sugar, there’s no getting away from that – is a treat in both senses of the word. It is for the weekend dessert, the Saturday morning scone, the Easter Sunday cake. To quote Henry once more, this time from Salt, Sugar, Smoke. ‘If it is jam that has been made with care, that comes from fruit you picked, that is delicious and starts your day off well, it is very much more than just a jam’ – and perhaps we should see it like this. Trim the rhubarb and cut into 3/4-inch lengths. Place into a saucepan, layering with the jam sugar as you go. 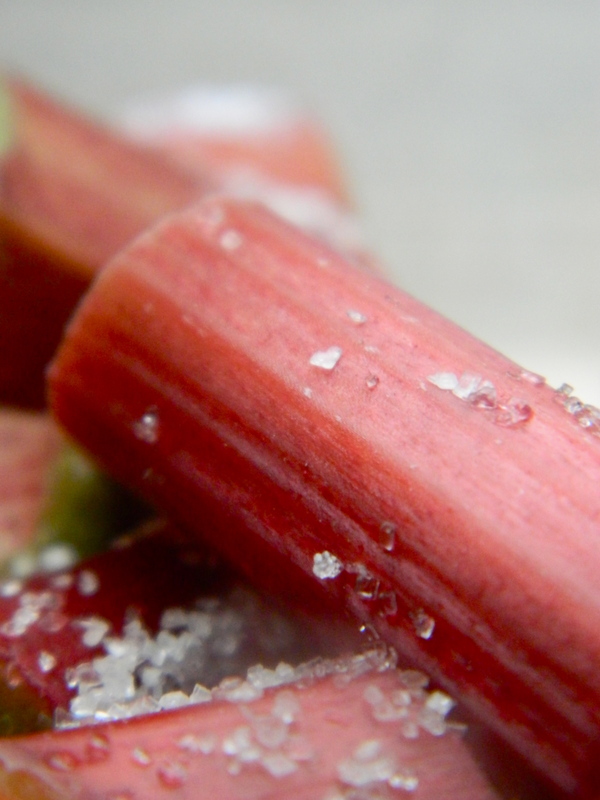 Pour the lemon and apple juice over the rhubarb and sugar, stir well and cover with a clean tea towel. 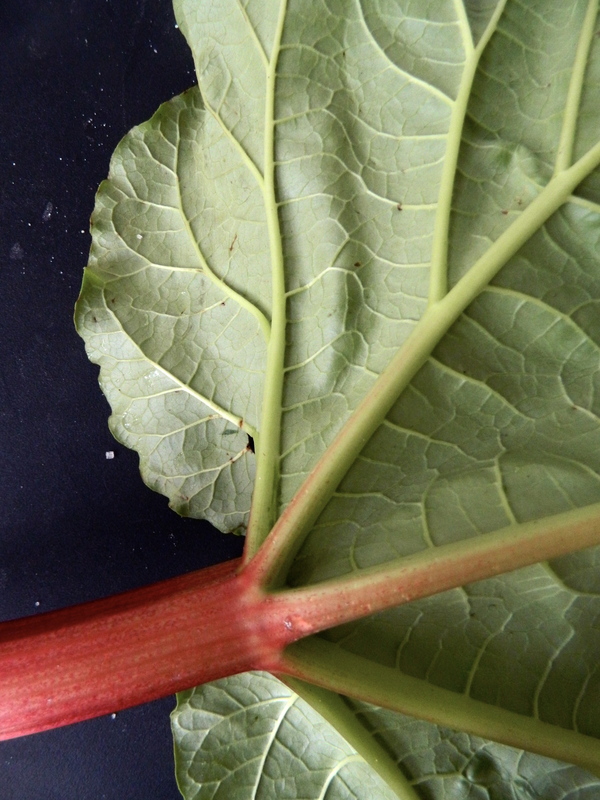 Leave it overnight – the juices from the rhubarb will be drawn out. Next day, add the cardamon to the rhubarb. Slowly bring the contents of the pan to a boil, stirring a little but ensuring not to break the rhubarb pieces up too much. Skim off any scum that rises. 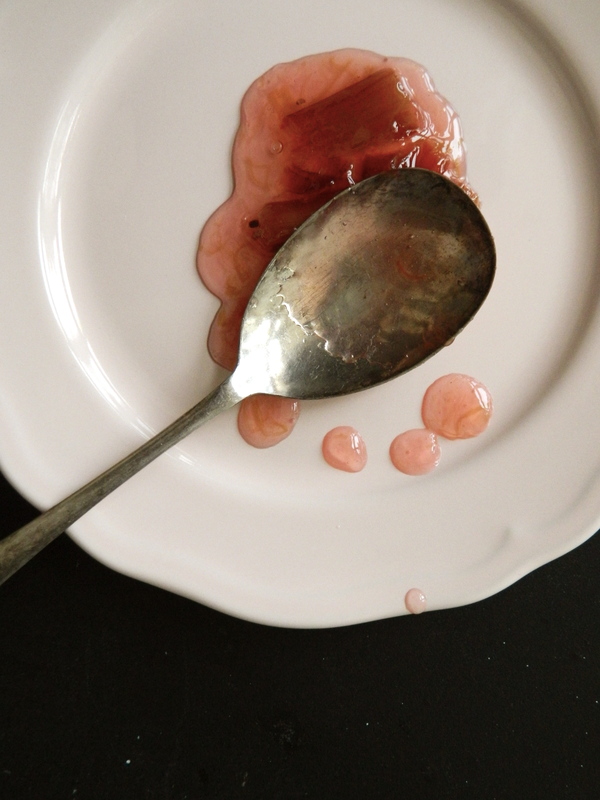 After boiling for about five minutes, drop a little of the jam onto a plate. If it seems fairly set and the rhubarb pieces are nice and soft, take it off the heat. 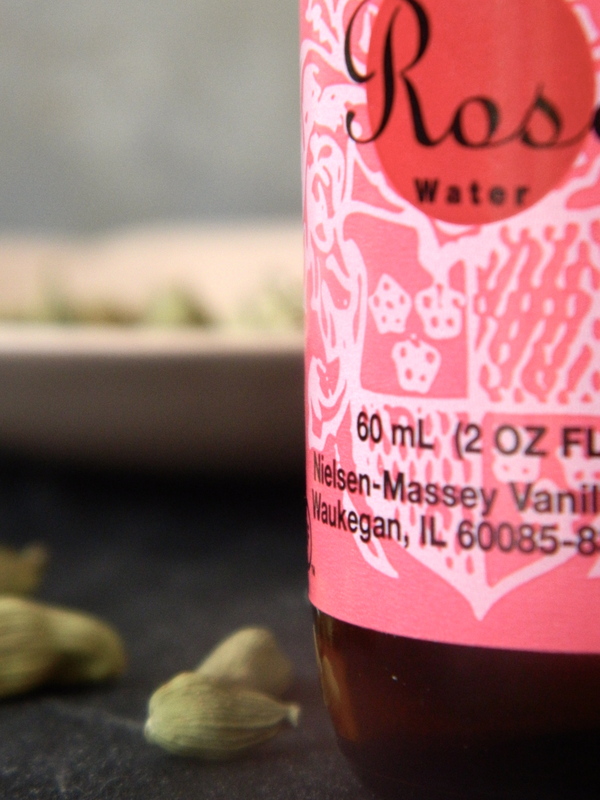 Add the rose water. Henry suggests returning it to the heat again at this point for a few more seconds but I forgot to do this and it worked out fine. Taste the jam. Add a little more lemon juice for freshness or some more rose water as desired. Pot it in warm, dry, sterilized jars; covering with waxed paper discs and seal. This keeps for a year – refrigerate after opening.